PLAYA DEL REY — As the sands of time figuratively passed since she beached onto the shores of Playa del Rey, so did the amount of the granular substance that literally filled her interior. 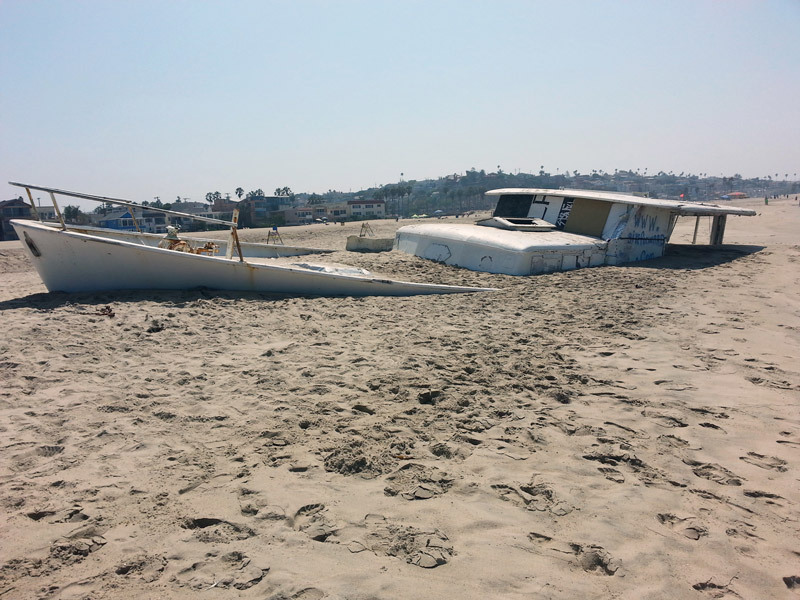 In fact, so much sand filled into the 77-foot boat beached at Dockweiler State Beach in Playa del Rey that it will cost taxpayers nearly a quarter million dollars to remove her from the shore. According to the Department of Beaches and Harbors, city and county officials have allocated $227,500 to remove Angelique from the sand and dispose her at sea, more than a year after she beached onto the northern edge of Playa del Rey. She crashed onto Dockweiler State Beach Feb. 27, 2014, shortly after breaking anchor during a storm. Los Angeles County Supervisor Don Knabe introduced a motion at the Feb. 24 Board of Supervisors meeting to approve funding for the boat’s removal from Dockweiler State Beach. According to Knabe’s motion, Angelique’s owners — Cosmo Mitchell and his wife — lived aboard the 77-footer and were rescued by the Coast Guard, Sheriff’s Department and other personnel after she broke anchor. Once rescued, the Mitchells temporarily took shelter with the American Red Cross but eventually moved away. Knabe added the Mitchells did not leave any contact information behind. The Log was also unable to reach Mitchell for this story despite being in touch with him in September 2014. Several attempts to contact Mitchell via email were unsuccessful. How Angelique beached ashore depends upon who you ask. News reports published shortly after the boat beached stated Mitchell anchored Angelique offshore and fell asleep ahead of the storm. Mitchell reportedly woke up the following morning and discovered his anchor was dragging. Unable to regain control, Angelique eventually beached in Playa del Rey. Shortly after his boat beached, Mitchell, authored a post on the fundraiser website GiveForward.com and stated Angelique — with three passengers and three dogs aboard —apparently ran out of gas in the middle of a storm before the anchor failed. It was this combination that, according to Mitchell, caused Angelique to find itself at water’s edge in Playa del Rey. Mitchell’s online campaign to raise $5,000 was unsuccessful. According to GiveForward.com, the fundraiser ended July 22, 2014, with 27 donations and $1,205 raised — an amount significantly less than what city and county officials will spend to remove Angelique from Dockweiler State Beach. When he spoke with The Log via email about six months ago, Mitchell said him and his wife were making progress in digging Angelique out of the sand before law enforcement officials asked them to stop. According to Carol Baker, spokeswoman for the Department of Beaches and Harbors, Global Diving and Salvage earned the contract to remove Angelique. The city of Los Angeles will contribute $100,000, provided by a state grant, to help pay with the removal. Los Angeles County Sheriff’s Department will contribute $80,000, drawing the funds from a Cal Boating grant. Baker said her department will pay the remaining $47,500 out of its Operating Fund Budget. The city’s Bureau of Sanitation was designated at the department leading the removal project. In his motion, Knabe stated Global Diving and Salvage determined it would be more efficient to try to dispose of Angelique at sea. “[The company] assessed the situation and determined it is impractical to salvage the wreck, so the most economical and practical way to remove it from the beach is to refloat the vessel and tug it out for disposal at sea,” Knabe’s motion stated. The Log unsuccessfully made several attempts to reach Rowena Romano, an environmental engineer with the Los Angeles City Bureau of Sanitation, to determine why the removal process costs $227,500 and if the bill could have been lower had city officials tried to remove Angelique earlier. Removing Angelique has been a joint effort between city and county officials. Playa del Rey is governed by the city of Los Angeles. The portion of Playa del Rey where Angelique beached is a few feet away from neighboring Marina del Rey, which falls under county jurisdiction. “The Department of Beaches and Harbors and the Sheriff’s Department have been active participants in the effort to properly secure the wreck since it first washed up on the beach and will continue to provide any necessary support until the wreck is removed and the beach is restored to a safe and sanitary condition,” Knabe’s motion stated. A timeline of when the removal would be complete was not announced.